» PC Gaming » Is Overwatch Destined For eSports? Is Overwatch Destined For eSports? Plenty of people have picked up Overwatch, over 10 million to be exact, but does that necessarily mean that it’s destined for a spot in the eSports scene? I just bought Overwatch yesterday since a close friend of mine bought it and wanted some more friends to play with. I participated in the Overwatch open beta and I thought it was pretty fun, figured that the full game would deliver as well! It’s Blizzard, So What Do You Expect? Although they haven’t had any game like Overwatch developed before, Blizzard is easily one of the best game development companies out there. With successes such as World of Warcraft and the Diablo series, it makes complete sense that any new game that they wish to develop is going to have a massive focus on the overall polish of the experience. It’s awesome what taking risks can do, especially in the gaming industry. Overwatch is definitely a prime example of that with the highest amount of players in any open beta ever to having over 10 million players – and counting – actively playing the game. A genre that Blizzard has never gotten into before in the past. So far, for now, the full game is basically the same experience as the open beta and it’s still pretty awesome. If you like team based shooters such as TF2 then you should definitely keep an eye on Overwatch. Blizzard wants to put a focus on implementing Overwatch into the eSports scene and for good reason. eSports is now bigger than ever and it’s only going to grow for many, many years to come. Could Overwatch Do eSports Though? You can’t argue that it’s a total team based game which is the ideal route for bringing a title into the eSports atmosphere but can Overwatch actually become that type of a game? It seems that they are definitely headed that way. With new updates coming soon to add a ranking system and with promises of free updates which include more maps and heroes – I can totally see this game evolving into something much, much bigger than what it already is. Content is king in games so if Blizzard can stay active for a good few years adding more and more to the game, while also keeping everything balanced as it is, then I believe that they can have one of the most successful eSports titles ever. If you take a look at games such as Counter Strike, Dota 2 or even Team Fortress 2 – they’re hugely successful eSports titles and they all revolve around coordinating the right cooperative strategies with a team to ensure victory. I even went to school with someone who is currently sponsored by a local game shop and he also gets a piece of the pie in tournament winnings. He is an excellent Call of Duty player and with a game like that, it pays to be some of the best players. With the overall growth of eSports, I know that eSports is looking for new content as well. Sure, companies can start to develop their own source of tournaments or they can link up with some existing platforms… Surely enough, Overwatch is already mentioned in the Wikipedia page for eSports games – teams are already rushing to get the first spots in the Overwatch scene. It’s going to be exciting to watch it all unfold! That’s what makes this game so awesome. Sure, there isn’t any other form of progression other than completing challenges and getting the coolest skins – but Overwatch still has a high replay value simply because it’s a fun game! So even though I’ll never actually be in an Overwatch eSports tournament (though you never know…), I’m still going to play he crap out of it! 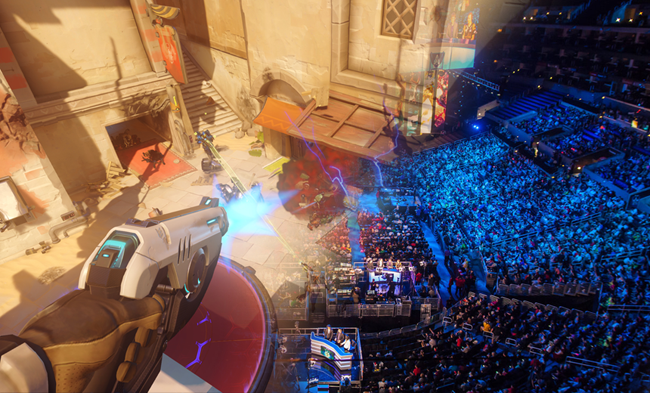 All in all, Overwatch is a fresher twist for the FPS genre and it’s getting a lot of attention to potentially become a huge eSports title. So, are you going to be picking up Overwatch? Do you think it’s a game capable of being apart of the eSports crowd? Tagged esports, overwatch. Bookmark the permalink. 2 Responses to Is Overwatch Destined For eSports? This game is awesome. I wanted to buy it. But the price raised from $40 to $60 and it’s not available in India. My bad luck. Only the Origins Edition is available in India? Or they increased the base game to $60? That’s a bummer man… it’s definitely worth $40 and if you know you’re going to invest a lot of time into it then $60 could also be a good amount for it. It’s an amazing game!